Muhammad ibn Musa Al-Khwarizmi is one of the greatest scientific minds of the medieval period and a most important Muslim mathematician who was justly called the 'father of algebra'. Besides his founding the science of jabr, he made major contributions in astronomy and mathematical geography. In this article, focus is laid on his mathematical work in the field of algebra and his contribution in setting the foundation of the Islamic tradition of mathematical geography and cartography. Islam gave birth to a new civilization that spread from China in the east, India in the south east, Russia in the north, and Anatolia in the west of Asia, to East and North Africa up to the Mediterranean regions of Southern Europe. This civilisation was marked by a deep interest in science. In the heart of the Islamic scientific tradition lays the queen of sciences, mathematics, where the scholars of bilad al-Islam (lands of Islam) excelled in all its branches practiced in pre-modern times. 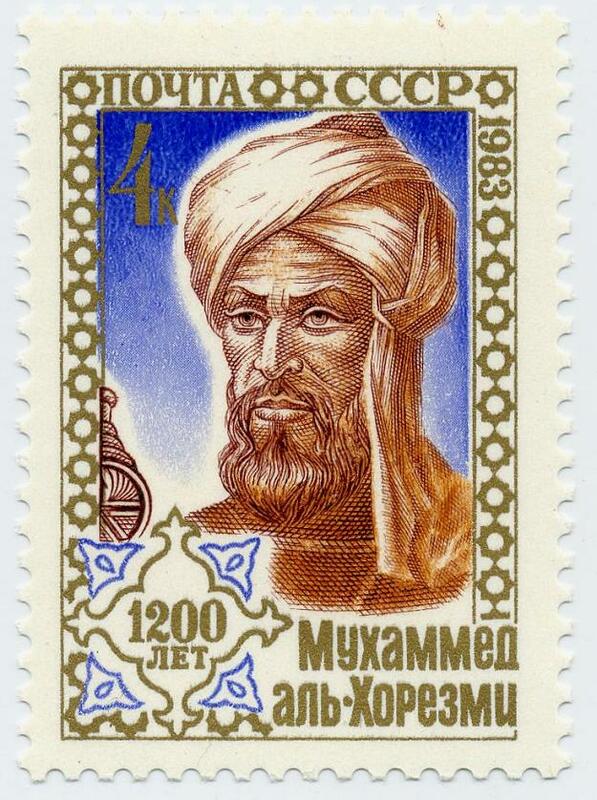 Figure 1: A stamp issued in honour of al-Khwarizmi by the former USSR post in 1983. The text in Cyrilic reads: 1200 Years, Mukhammad al-Korezmi. (Source). One of the greatest minds of the early mathematical production in Arabic was Abu Abdullah Muhammad ibn Musa al-Khwarizmi (b. before 800, d. after 847 in Baghdad) who was a mathematician and astronomer as well as a geographer and a historian. It is said that he is the author in Arabic of one of the oldest astronomical tables, of one the oldest works on arithmetic and the oldest work on algebra; some of his scientific contributions were translated into Latin and were used until the 16th century as the principal mathematical textbooks in European universities. Originally he belonged to Khwârazm (modern Khiwa) situated in Turkistan but he carried on his scientific career in Baghdad and all his works are in Arabic. He was summoned to Baghdad by Abbasid Caliph Al-Ma'mun (213-833), who was a patron of knowledge and learning. Al-Ma'mun established the famous Bayt al-Hikma (House of Wisdom) which worked on the model of a library and a research academy. It had a large and rich library (Khizânat Kutub al-Hikma) and distinguished scholars of various faiths were assembled to produce scientific masterpieces as well as to translate faithfully nearly all the great and important ancient works of Greek, Sanskrit, Pahlavi and of other languages into Arabic. Muhammad al-Khwarizmi, according to Ibn al-Nadîm  and Ibn al-Qiftî  (and as it is quoted by the late Aydin Sayili) , was attached to (or devoted himself entirely to) Khizânat al-Hikma. It is also said that he was appointed court astronomer of Caliph Al-Ma'mun who also commissioned him to prepare abstracts from one of the Indian books entitled Surya Siddhanta which was called al-Sindhind  in Arabic . Al-Khwarizmi's name is linked to the translation into Arabic of certain Greek works  and he also produced his own scholarly works not only on astronomy and mathematics but also in geography and history. It was for Caliph al-Ma'mun that Al-Khwarizmi composed his astronomical treatise and dedicated his book on Algebra. Figure 2: Modern statue of al-Khwarizmi at Khiva, in Ouzbekistan. Photo Alain Juhel. (Source). Muhammad ibn Musa Al-Khwarizmi is one of the greatest scientific minds of the medieval period and the most important Muslim mathematician, justly called the 'father of algebra'. He wrote the Kitâb al-Jem wa'l Tafrîq bi Hisâb al-Hind also called Kitâb Hisâb al-adad al-Hindî on arithmetic in which he used Indian numerals  including zero in place of depicting numbers by the letters of the alphabet and the decimal notations or numeration by position for the first time. It deals with the four basic operations of addition, subtraction, multiplication and division as well as with both common and sexagesimal fractions and the extraction of the square root. The original Arabic text of the book is lost and only its Latin translation is available. 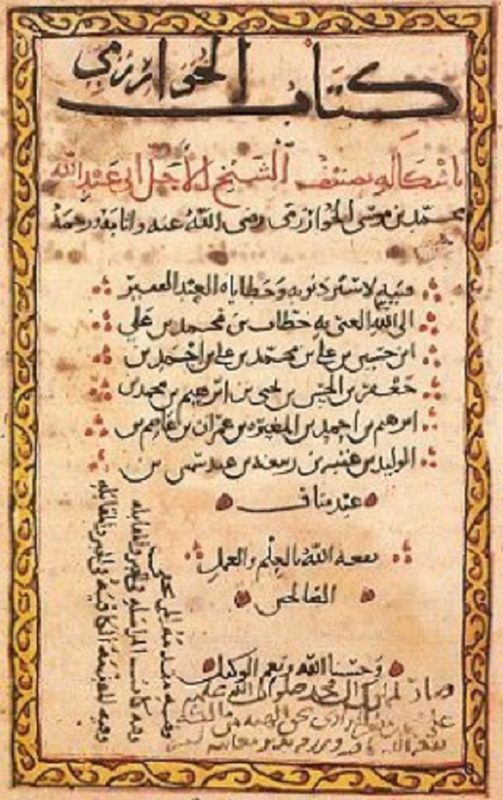 Figure 3: Title page of an Arabic manuscript copy of al-Khwarizmi's Kitab al-jabr wa-'l-muqabala (Source). Other mathematical writings of al-Khwarizmi are also not known. His best known classical work on algebra is the Kitâb al-Mukhtasar fî Hisâb al-Jabr wa'l-Muqâbala. It was translated into Latin in the Middle Ages and holds an eminent place in the history of mathematics. According to the words of Galal S.A. Shawki , in this book al-Khwarizmi defined algebra as an independent disciple in mathematics, and accelerated the introduction of the Arabic place value numbering into the West. The book is devoted to finding solutions to practical problems which Muslims encountered in daily life  concerning matters of inheritance, legacies, partition, lawsuits and commerce, with over eight hundred examples. The original work in Arabic was written in 820 CE  and was translated into Latin in the 12th century. It is worth remarking that the term al-jabr, in the Latinized form of algebra, has found its way into the modern languages, whilst the old mathematical term algorism is a distortion of al-Khwarizmi's name. The meaning of the Arabic word Al-Jabr is restoration by transposing negative quantities to the other side of the equation to make them positive; and the term Al-Muqâbalah refers to the process of eliminating identical quantities from the two sides of the equation . But the best translation for Hisâb al-Jabr wa'l-Muqâbala, according to John K. Baumgart , is 'the science of equations'. The algebra of al-Khwarizmi was rhetorical in form. Al-Khwarizmi had given the rules for the solution of quadratic equations which are supported in a number of cases by geometrical proofs also. The unknown quantity, in the words of Galal S.A. Shawki, was termed the "thing" (shay') or "root" (jidhr); the latter means in Arabic the origin or base, also the root of a tree, hence, the use of the expression "root of an equation" is derived from this Arabic concept . Al-Khwarizmi had used the Arabic word for root to denote the first degree term of a quadratic equation. Explaining in detail he says: "the following is an example of squares equal to roots, a square is equal to 5 roots. The root of the square then is 5, and 25 forms its square, which of course equals 5 of its roots ." For the second power of a quantity he employs mâl (wealth, property) which is also used to mean only "quantity" and dirham is used as a unit of coinage. Figure 4: Manuscript copy of al-Khwarizmi's book of algebra; the MS was copied in 743 H in Cairo, 500 years after the death of al-Khwarizmi. © Oxford University, the Bodleian Library. The bases of algebra, first viewed as an independent mathematical discipline, were laid down by al-Khwarizmi who carefully formulated analytical solutions of the various forms of quadratic equation and profusely illustrated his method of solution by practical examples . He was quite aware of the existence of two roots of the quadratic equation, though he cared for positive, real roots only . The book Hisâb al-Jabr wa'l-Muqâbalah is actually on applied mathematics. Its first part discusses the equations of the first and second degrees. All his proposed problems can be reduced to one of the six standard forms. He gives rules for the solution of each of the six forms and explains with examples how to reduce any given problem to one of these standard forms . The second part of the book deals with practical mensuration by giving rules for finding the area of various plane figures including the circle, and for finding the volume of a number of solids including cones and pyramids. The third and longest part concerns legacies as well as inheritance. It consists entirely of solutions to problems which arise out of legacies. Lawrence J. Schoenberg Collection, Manuscript Number: LJS 027, 115 folios. Illuminated for a member of the Albertini family of Nola, Italy, in 1478. (Source). Figure 6: Front cover of Al-Khwarizmi: The Inventor Of Algebra by Corona Brezina (Rosen Central, 2006). The mathematical works of al-Khwarizmi were used in European universities up to the 17th century. He is, in the words of 'Ali 'Abdullah Al-Daffa , the founder of algebra and had transformed the concept of a number from its earlier arithmetic character as a fixed quantity into that of variable element in an equation. He also found a method to solve general equations of the first and second degree in one unknown by both algebraic and geometric means . It was through his work on mathematics that the Indian system of numeration became known to the Arabs and later through its Latin translation to the people of Europe. He synchronized Greek and Indian mathematical knowledge but was the first mathematician to distinguish clearly between algebra and geometry and gave geometrical solutions of linear and quadratic equations. Figure 7: Two instances of the modern application of algebra: a book of algebra for electronic circuits and a pocket calculator. Al-Khwarizmi had also contributed to the science of geography. As the book of Geography of Claudius Ptolemy (2nd century CE) was translated several times into Arabic, he had a model for writing his book in this field of knowledge. His book on geography entitled Kitâb Sûrat al-Ard (Book of the image of the earth) consists almost entirely of lists of longitudes as well as latitudes of localities and gives in a tabulated form the coordinates of the places such as cities, mountains, seas, rivers and islands. The book is arranged according to the Greek system of the seven climes (aqâlim) giving contemporary data but the knowledge acquired by other Muslims is also incorporated into it. The first section lists cities, the second, mountains (giving the coordinates of their extreme points and their orientation); the third, seas (giving the coordinates of salient point on their coastlines and a rough description of their outlines); the fourth, islands (giving the coordinates of their centres, and their length and breadth); the fifth, the central points of various geographical regions; the sixth, rivers (giving their salient points and towns on them) . This book had served as a basis for later works and stimulated geographical studies and the composition of original treatises. It is said that his Kitâb Sûrat al-Ard was also accompanied by regional maps of each of the climes and by a single world map called "al-Sûrat al-Ma'muniyya" but these have been lost. It is also said that his map of the world was the first map of the heavens and the earth drawn by Muslims. But the editor of the Kitâb Sûrat al-Ard, Hans von Mzik, has produced only four maps. These four maps, in the words of S. Maqbul Ahmad , seem to be later recessions of the original maps. But Ibrahim Shawkat  argues that since Al-Khwârazmî wrote a brief work on geography, he did not draw a complete map of the world but confined himself to draw only the four maps as an illustration. His source of inspiration might possibly have been the mappa mundi  constructed for Caliph Al-Ma'mun by a team of geographers in which Al-Khwârazmî himself would have been included . Figure 8: A map by Abu Zaid Ahmed ibn Sahl al-Balkhi (850-934), a Persian geographer who was a disciple of al-Kindi and also the founder the "Balkhī school" of terrestrial mapping in Baghdad. Picture displayed on "Old Manuscripts and Maps from Khorasan". (Source). The Kitâb Sûrat al-Ard depends, even if in an indirect manner, on the Geography of Ptolemy , but in the opinion of Ibrahim Shawkat, it was based on the work of Marinus . The book was produced under the patronage of the Caliph Al-Ma'mun in about 830 CE. The towns and mountains are presented in a tabulated form, and oceans, seas, islands, countries, springs and rivers are given in a descriptive form. Again, towns, mountains, springs and rivers are described according to the climes (aqâlim) to which they belong, while the description of the oceans and seas is free from the limits of these climes. Similarly islands are described under the seas and oceans to which they belong. The description of the countries is also free from the limits of the climes. Along with the geographical names of the Muslim period, a large number of ancient place names are also founded in the book but in the later portions these names rapidly begin to disappear. The map of the world of al-Khwarizmi called al-Sûrat al-Ma'muniyya has now been fully reconstructed by an Indian scholar, Dr. S. Razia Jafri , on the basis of description and data given in his Kitâb Sûrat al-Ard. It is divided into 38 sections which are again sub-divided into 1740 small squares from West to East and into 1200 small squares "from South to North. Each clime (iqlîm) from West to East is again divided into seven sections. It is to be noted that the general division of the Map into climes is according to al-Khwarizmi, but the sub-division of the climes into sections is arbitrarily done by Dr. Razia Jafri. In this way it is just like an Atlas. It is to be noted that the Soviet Academy of Sciences of Tajik is publishing it along with the forward and introduction of Dr Kamal Ayni and Prof. S. Maqbul Ahmad respectively. The printing of this work is done under the supervision of Prof. M.S. Asimov who was the eminent scholar and the president of the Academy of Sciences of the former Soviet Tajik Republic at Dushanbe. Figure 9: Map of South Caucasus drawn ca. 950 CE by the geographer al-Istakhri in his Kitab al Masalik wa-al-Mamalik (Book of roads and provinces), showing Armenia with Mount Ararat, Lake Van and Azerbaijan. The map shows. Printed in Maps of Ancient Armenia by Roubik Galichian (London, 2004). (Source). Al-Khwarizmi is the author of several other books on astronomy and history. He became well known as a mathematician and it is said that he is the author of the oldest work on algebra. But the late Professor Aydin Sayili says in one of his research papers entitled "Turkish contribution to Science" as follows: "Abu'l Fadl cAbdulhamîd ibn Wâsic ibn Turk was apparently the first Islamic mathematician to write a book on algebra. Indeed, he very likely wrote his algebra before Al-Khwârazmî wrote his. For unlike Al-Khwârazmî, he did not write an unabridged algebra, and, moreover, there is evidence that Al-Khwârazmî was still alive at about the middle of 9th century. cAbdulhamîd ibn Turk was also the author of certain books on numbers, on commercial arithmetic, and on the art of calculation, probably with the decimal system. Now, it is not possible for me to agree or disagree with him but it is realistic to say that the works of al-Khwarizmi on mathematics have great influence in the birth of Western Science and he is rightly called the "father of algebra" and a peerless geographer ." Figure 10: A world map by al Istakhri (934 CE). The map is oriented with South at the top. Picture displayed on "Old Manuscripts and Maps from Khorasan". (Source). Adivar, Abdulhak Adnan, "Harizmi" in Islam Ansiklopedisi, vol. 4, p. 261. Fihrist al-Ulûm, edited by Flügel, vol. 1, 1871, p. 274. Historical topics for the Mathematics Classroom, Washington 1969. Hocker, Sidney G., and others, Fundamental Concepts of Arithmetic, 1963, p. 9. Hogbin, Lancelot, Mathematics for the Million, New York 1946, p. 291. Jones, Philip S., "Large Roman Numerals", The Mathematics Teacher, vol. 28, p. 261. Khara'it Jughrafiqyyi al-'Arab al-awwel, Majallet al-Ustadh of Baghdad, 1962, pp. 7-8. Kokomoor, Franklin W., Mathematics in Human Affairs, New York 1946. Ronart, Stephen and Nandy, Concise Encyclopaedia of Arabic Civilization, New York I960, p. 295. Sayili, Aydin, "Turkish Contributions to Scientific Work in Islam", Belleten (Turkish Historical Society), vol. 43, Ankara 1979, s. 16. Sayili, Aydin, The Observatory in Islam, Ankara 1960. Shawki, Galal S.A., Formulation and Development of Algebra by Muslim Scholars, published in Islamic Studies of Islamabad, vol. 23, No. 4, p. 338. Tafkir al-cArab al-Jughrafi wa'itaqat al-Yunan bihi", extract from the Journal "Al-Ustadh", Baghdad 1961. Tarikh al-Hukama, edited by Lippert, Berlin 1903 (Cairo edition, 1326 H), p. 286. The Muslim Contribution to Mathematics, London 1977, p. 7. Toomer, G.J., "Al-Khwârazmî", Dictionary of Scientific Biography, vol. 7, pp. 359-361. Turkish Architecture, translated by Prof. Dr. Ahmet Edip Uysal Ankara 1965, p. 2. Zemanek, Heinz, "DIXIT Algorizmi - His Background, his Personality, his Work, and his Influence". Source Lecture Notes In Computer Science, vol. 122. Proceedings on Algorithms in Modern Mathematics and Computer Science. Berlin: Springer-Verlag, 1979, pp. 1 - 81. Aydin Sayili, The Observatory in Islam, Ankara 1960, p. 55. Abdulhak Adnan Adivar, "Harizmi" in Islam Ansiklopedisi, vol. 4, p. 261. It was first introduced in Baghdad by an Indian traveller in 771 CE, which by order of al-Mansur was translated into Arabic by Muhammad ibn Ibrahim al-Fazârî between 796 and 806 for the first time. Stephen and Nandy Ronart, Concise Encyclopaedia of Arabic Civilization, New York I960, p. 295. Ya'qub bin Tariq is said to be the first Muslim to introduce Indian numbers to Arabs. Galal S.A. Shawki, Formulation and Development of Algebra by Muslim Scholars, published in Islamic Studies of Islamabad, vol. 23, No. 4, p. 338. Lancelot Hogbin, Mathematics for the Million, New York 1946, p. 291. Sidney G. Hocker and others, Fundamental Concepts of Arithmetic, 1963, p. 9. Galal S.A. Shawki, Formulation and Development of Algebra…, op. cit., p. 338. Historical topics for the Mathematics Classroom, Washington 1969, pp. 233-4. Islamic Studies of Islamabad, vol. 23, No. 4, p. 339. Philip S. Jones, "Large Roman Numerals", The Mathematics Teacher, vol. 28, p. 261. Islamic Studies of Islamabad, vol. 23, No. 4, p. 351. G.J. Toomer, "Al-Khwârazmî", Dictionary of Scientific Biography, vol. 7, p. 359. Franklin W. Kokomoor, Mathematics in Human Affairs, New York 1946, p. 172. G.J. Toomer, "Al-Khwarizmi", Dictionary of Scientific Biography, volume 7, p. 361. Encyclopaedia of Islam, (new edition), vol. 4. Mappa Mundi is a term used for the map of the world. Encyclopaedia of Islam, vol. 4, p. 1078. Tafkir al-cArab al-Jughrafi wa'itaqat al-Yunan bihi", extract from the Journal "A l-Ustadh", Baghdad 1961. One of the staff members of Aligarh Muslim University of India. Aydin Sayili, "Turkish Contributions to Scientific Work in Islam", Belleten (Turkish Historical Society), vol. 43, Ankara 1979, p. 16. Click here. *Dr., Department of Islamic Studies Aligarh Muslim University, Aligarh, India. This article was first published in the Proceedings of the International Symposium on Ibn Turk, Khwârazmî, Fârâbî, Beyrûnî and Ibn Sînâ (Ankara, 9-12 September 1985), Ankara, 1990.